Our Gift Vouchers are personalsied with the message of your choice and can be used for full or part payment towards any of our courses across the UK. All Vouchers are valid for 12 months which allows the bearer enough time to book on to any of our seasonal courses in Spring, Summer or Autumn. Once you have paid for your voucher you will receive an email from us, please respond to this with the personal message that you would like on your voucher. 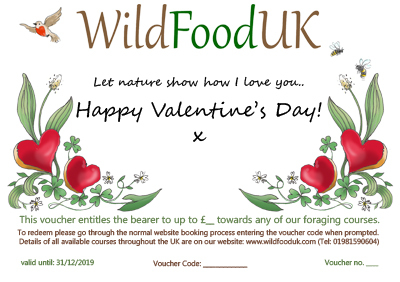 After we have created the voucher it will be emailed to you to print or send to them personally, or we can email it directly to the recipient on your behalf. We do not send out hard copies. Generally our courses are £45 but some of our venues have individual pricing. Please check the prices of our current courses in the area you expect your friend to be booking, before selecting your voucher or vouchers from the list below. 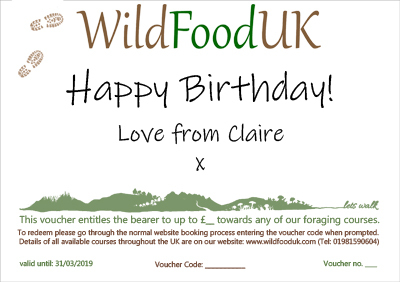 If you have any trouble booking then please email admin@wildfooduk.com or call 01981 590 604.